Four medium-density fiberboard shelves have enough space to hold your projector, document camera, laptop and more. Shelves feature a PVC finish to protect them from scratches and dings. Wire management grommets in the top shelf and the laptop shelf make it easy to keep your space tidy. Includes a 6-outlet power strip. 18-gauge steel frame withstands heavy use. 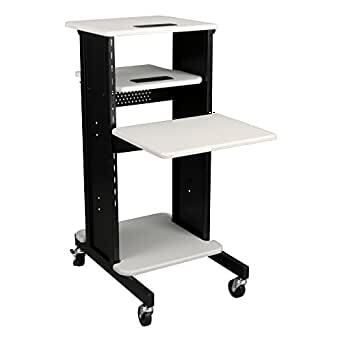 The laptop caddy presentation cart from Norwood Commercial Furniture provides you with plenty of space for your classroom presentation materials. The four medium-density fiberboard shelves have enough space to hold your projector, document camera, laptop and more, and they feature a PVC finish to protect them from scratches and dings. Plus, wire management grommets in the top shelf and the laptop shelf make it East to keep your space tidy. The durable steel frame withstands heavy use, and four casters (two locking) give you the option of easily moving the caddy from room to room, or keeping it stable when in use. I use these in a middle school in all classes for teachers’ laptops, projectors and document cameras. The cart is easy to assemble and highly durable. I’m using the Norwood cart as an alternative to a standing desk. I modified the assembly instructions to change the orientation of the shelving and added a monitor mount to the top. For the price I love this as a solution. However, the cart didn’t hold up well in shipping. There were a couple of dings in the vinyl coating on a couple of the shelves. One area peeled off from the ding (a small tic-tac size hole that exposes the wood). It’s not impacting my use of the cart and it’s already assembled so I will live with it. In the future it probably needs more padding between the shelves in the shelf boxes. I also assumed that since there were holes on the shelf mounting side that it was a standard 19″ rack and would accept rack mount gear, despite no mention of it in the description. This is not the case. Very nice and sturdy cart! Looks attractive–good finish on all pieces, smooth edges, no rough surfaces. Keeps our school projector, projection system laptop, and all of the associated cords and cables safe, neat, and tidy, so everything looks professional. Casters roll well, and the locking casters hold the cart safely in place. Comes with a power strip that you permanently attach to the cart, making it easy to plug in several things for the projection system by only stringing out one cord for the entire cart, instead of one cord for each thing on the cart. The cart was easy to assemble. It took me less than 15 minutes to assemble it. Heavier than I thought from Specs. Very sturdy though and well designed. Works very well for Audio-visual stand and computer. This was just was we needed to keep our laptops organized. One of the shelves adjusts so we can work while sitting or standing. We especially like that it rolls, so if we’re looking at a recipe, the cart can go with us to the kitchen. The surge protector is flush against the side and makes keeping cords neat very easy. This cart is nice, easy to move around with the large and sturdy wheels it comes with. I am using it for a medical device and the adjustable shelf is perfect for the controls making it easy for use while in a chair or in bed. It would have been more useful with an additional shelf which I will, at some point, make for it. Still a descent cart for the money. I’m really happy with this product. It’s sturdy and well-made. The assembly was fairly easy and everything lined up well. The extending adjustable shelf was the only part that needing firm coaxing into place. I would have loved an extra shelf option, but I knew what I was buying and can’t complain. for what it is it works but the way I have it set up it is always rolling back wards or getting in the way with the wheels and i took that shelf off that sticks out. It was just too long. Honestly, we are about to trash ours.